An Instant hair transformation for your hair Fibre. A 15 minute service that addresses to two hair concerns simultaneously. A perfect accompaniment to regular services such as haircuts, blow-dry etc for instant results. Visit TONI&GUY Salons and step into the Kérastase Scalp and Hair Institute – a cocoon of indulgence and exclusitivity. You will be personally attended to by a highly trained Kérastase Ambassador who will diagnose your scalp and hair concerns with a special camera. The dual lens of the camera magnifies your scalp 200 times and your hair 600 times to minutely examine your scalp and hair condition. Based on the concerns identified, the Kérastase Ambassador recommends the most appropriate salon Ritual (hair care treatment) and home care products. Kerastase is one of the most luxurious hair care brand. 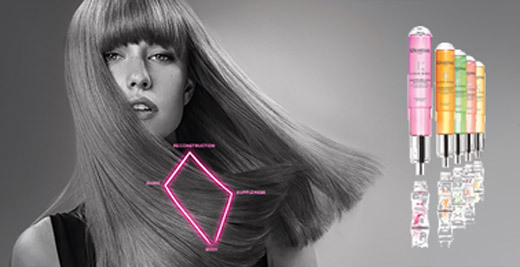 Kerastase technology is distinguished by unique formulation charter prototype formulas with powerful active ingredients, high tech molecular complexes and sensational textures, science inspired by the quest for beautiful Hair. Founded in 1963 in Clapham, London by Toni Mascolo and brother Guy, the company has excelled in setting trends & standards in global hair styling, driven by its 50 years of experience since inception. Assuming a commitment to the education and training of their super talented staff and to their philosophy of pushing the boundaries of hairdressing to deliver creativity, quality and consistency to every client, TONI&GUY has long been renowned as an innovator within the hair industry. TONI&GUY further offers exclusive products of Label M Brand and Kerastase a French luxury hair and scalp care brand. label.m is the official haircare product of the London Fashion Week – and is an award-winning fashion-inspired range developed by professional stylists under the creative eye of a dynamic International Artistic Team led by Toni Mascolo & Sacha Mascolo-Tarbuck.